I always enjoy my visits to Bugg Elementary School in Raleigh, NC. 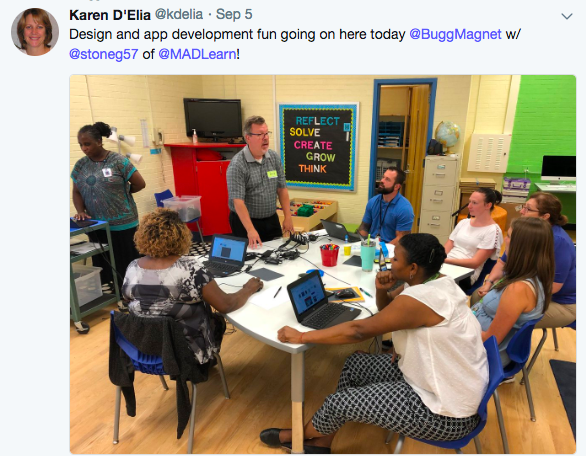 This STEM Magnet school is driven by the Design Thinking Process, providing students with a variety of tools and curricula to help them understand and appreciate the importance of developing vital and transferable skills (commonly called “soft” skills) like creativity, problem-solving, cooperation, and more. Anatural byproduct one would hope to see catch hold is an interest in developing a sense of entrepreneurship. During my last visit, it was mentioned to me that there was a group of fifth-graders who wanted to start a school store in which students could use community expectation points (referred to as “dojo” points) instead of cash to buy items as diverse as pencils and pens to journals, storage boxes, and even school t-shirts and key chains. The group was also excited about the idea of the store having an app that the students could use to place their orders. These students had created apps using MAD-learn in their science classes last spring. One student immediately started asking me about the possibilities of building such an app when he came in with his regular class. September’s MAD-teacher of the Month Alisa McCollum and her team designed the school community-centered project, called “All About Super Me”. which this student was working on. I quickly agreed to meet with the young man and his team during their lunch period the next day. The four students showed up ready to get right down to business on their School Store app. 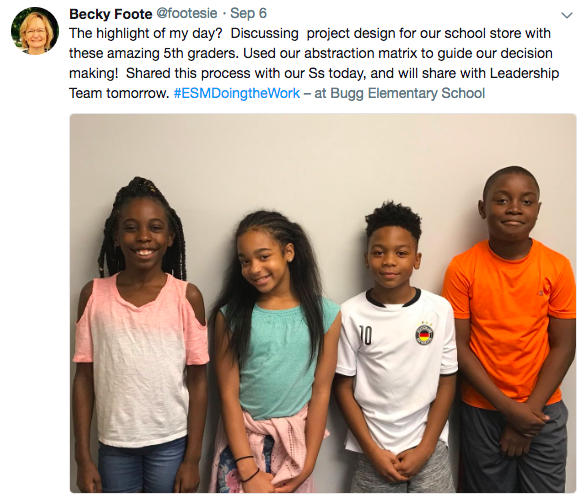 They had a keen sense of what types of merchandise would be most popular, and they understood that it was probably a good idea to start with a limited number of items for sale while they gauged the logistics and success of the store and its app. We talked about what the design of the app would look like and how it would function. I was impressed to see how much they were able to use their prior app building experience to visualize how the School Store app would best function. The students now have a plan in place to ensure the app is built and live in time for the launch of the School Store. As a former classroom teacher and administrator for 30 some years, I always welcome opportunities to work directly with students in their classes. This experience, and many others like it that I’ve enjoyed, represent the most rewarding aspects of my work with MAD-learn and the schools we serve. To be able to look at the faces of these 10 year olds and be able to picture them as successful adults in the future is what we’re all about!